Get updates and reminders about the course reserves process from Western Libraries. Reserves staff are currently working on 321 course reserves lists with 555 course sections for Spring 2019. How do I locate course reserves lists? 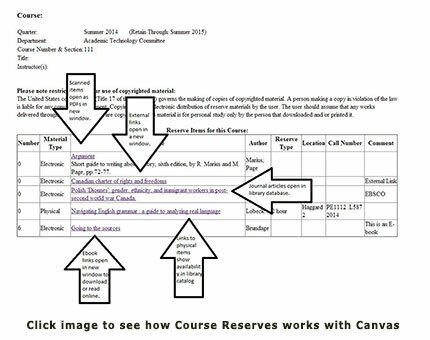 Log in to the Canvas page for your course and look for the navigation tab “Course Reserves” on the left side of the page. Links to physical items (books and videos) will show call numbers and availability. Links to electronic items (articles, book chapters, ebooks, streaming media, external content) will open in a new browser window. Where are physical reserves shelved? Physical items are located in the Haggard 2 Reserve Area and are shelved according to call number. Library-owned books are shelved in Library of Congress call number order in the front of the Reserve Area. Instructors' personal books are assigned a call number and shelved numerically on the half-height shelves. Videos on reserve are located at the Circulation Desk on the second floor of the Haggard Wing of the library, and can be viewed at stations located in the Reserve Area. What are the loan periods for physical reserves? Instructors choose the check-out duration for books – 2 hour, 1 day, 3 days or 7 days. Videos are loaned for 4 hours. Are there fines for overdue reserve material? Course reserve items are fined at $2.00 per hour. Can I request additions to reserve lists? Only instructors or their designated representatives can place material on course reserve. Contact them to request additional reserve items. Can't library staff just look up reserves information for me at the circulation desk? 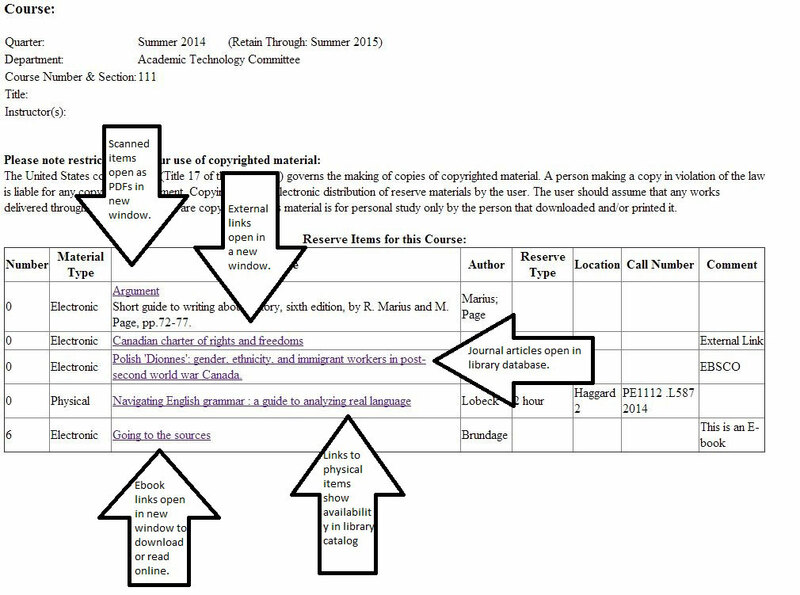 While library circulation staff can assist with call number lookup if necessary, course reserves are intended to be self-service, and students are expected to use Canvas to access reserves material and information independently. What about damaged books/missing pages/defective videos? Please inform circulation staff about any damaged material so they can contact the instructor about personal copies and/or repair and replace library-owned items as soon as possible. What about broken links to electronic material? Contact Course Reserves at Library Course Reserves course.reserves@wwu.edu or inform circulation staff.